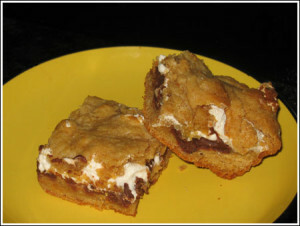 An old recipe from the Hershey's kitchen, this is my all-time favorite S'mores bar. Heat oven to 350°F. Grease 8-inch square baking pan or line the pan with foil and spray foil with cooking spray (makes cutting easier). Beat butter and sugar in large bowl until light and fluffy. Add egg and vanilla; beat well. Stir together flour, graham cracker crumbs, baking powder and salt; add to butter mixture, stirring until blended. Press half of dough into prepared pan. Arrange chocolate bars over dough, breaking as needed to fit. Spread with marshmallow creme. Scatter bits of remaining dough over marshmallow; carefully press to form a layer. Bake 30 to 35 minutes or until lightly browned. Cool completely in pan on wire rack. Cut into bars. 16 bars.